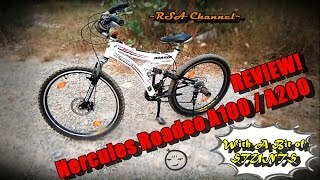 If you are an adrenaline junkie or fitness enthusiast, then this Hercules Roadeo mountain cycle is for you. This cycle features a front disc brake, 21 speed gears, and comes with robust tyres with lightweight butyl tubes. The front disc brake is durable and effective in all weather conditions, and is highly responsive to make mountain biking safe and thrilling for you. The Shimano 21 speed gears help you adjust the gears according to different terrains. So, you can maintain a steady riding speed and ride a for longer duration without exhausting yourself. To reduce the impact of riding on rough terrains, this cycle has the front and rear suspensions to ensure your comfort. The aluminium-frame makes this a lightweight, rust-resistant cycle suitable for riding in wet weather conditions. The robust tyres come with lightweight, reliable and low-maintenance butyl tubes.